my husband & i have stayed at the crystallo appartments in paphos for many years. it is like going home. george, crystalla, & stathis are so friendly they make everyone welcome. the cleaners are good and have been there for years. yes the appartments are basic but clean & adequate as a base for your holiday. we love it there & would recomend anyone to go there. we were there in june & have booked again for later this year. 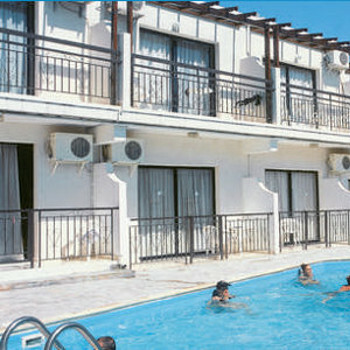 We chose the Crystallo Apartments based on favourable reports we'd read on here and were not dissapointed. Yes the decor could do with a revamp, but as the owner George will tell you "if you want 5 star treatment you book into a bigger hotel." The apartments are a good size,comfortable and clean. There is a small pool area and there's always sunbeds avialable if needed. It was about a 5 minute walk to bar street and 10 to 15 minutes to the harbour depending how quick you walk, so all in all a good base for a self catering holiday and to get around Paphos. The owner Geroge is there to greet you when you arrive and was even up and about when we left at 4 in the morning. The only things we'd like to see improved is the shower, which was definitly on it's last legs and slightly better cooking facilities as we had to eat out every night which stretched the budget. 3rd year in cyprus, second staying at crystallo apartments. excellent value, rooms spotless numerous changes of linen and towels. good location-quiet but only a few minutes walk to bars and restaurants. this would be my first choice of accomodation for my return to cyprus in the near future. Our weeks stay in the Crystallo Apartments was wonderful. We stayed in a 1 bed roomed apartment and it was a very good size, more than big enough for the two of us. The rooms were cleaned everyday, with bed linen and towels changed once during out stay. The rooms were in need of some TLC and could do with a modernisation, but other than that they were more than adequate. The kitchen had everything you need. Just one point to note - you will need a dish cloth, tea towel and loo roll as none of these are supplied. The pool was small, but that and the pool area were cleaned daily. During most of our stay it was just the two of us round the pool so it felt like out own personal pool. The location was perfect, far enough out to be quiet but close enough to walk into the main centre. The road running past the apartments was not a problem - very little traffic during our stay and not much after midnight anyway. George and his son were more than happy to help with anything and made it very much feel like home. I would definitely recommend the Crystallo Apartments to anyone and we hope to go back later this year. Apartments basic but clean. ALL guests are with Libra Holidays so previous message from somebody claiming to have travelled with Thomas Cook didn't go to the same apartments as us. George (the owner) or his son (Statis) were on duty for every arrival what ever the time of night or day. Suitcases with wheels and ceramic tiles are the reason arrivals and departures are noisy. The pool was indeed small but as there were only 3 or 4 people in it at any time this was not a problem. The road noise is a problem though. The main reason is that it is an easy route to the dual carriageway used by the local "Boy Racers". The Seahorse raved about by previous writers was closed for most of our visit for refurbishment, but was due to open the day we left, for Sunday lunch. Position great as an easy fairly level walk for most places. The pavements generally left a lot to be desired.If there was a decent one somebody parked a car on it!! The studio we had was looking onto the pool and was a decent size, yes the pool was small but as stated in a previous post there were never more than 3 or 4 people in it at a time so it wasnt a problem and the water was lovely and warm. I cannot say that i found the road noise a problem at all. Gregs takeaway just down the road was excellent and i would highly reccomend it. The apts were in a great location not too far away from anything. The Crystallo apartments are very basic but they did in fact serve their purpose (for sleeping). They were only several minutes away from Bar Street and about a 10minute walk to the Harbour. The pool is indeed small but in July it was like a bath. The staff there were friendly enough but a certain member of staff was a little too keen on the young girls..
All in all we would not visit these apartments again. Where do I begin. ok the good bits - erm that'll be the location and the fact that we got clean sheets and towels every 2-3 days. Our friends were getting married in Cyprus and so myself and a friend were looking for basic accommodation. BASIC doesn't have to be dirty and covered with ants and cockroach's. Our shower never worked properly (had to run around to get wet) some of the lights in the apartment did not work and the floor was absolutely filthy. The couple who owned the chrystallo were very friendly - unfortunately I cannot say the same about the son who worked there. This Was our 4th year at Crystallo appts and will be going again this year. George and his family are very friendly nothing was too much trouble. The pool is only small but never over crowded. The rooms are basic but very clean. The appts are very well situated the well known bar street is 5 mins away. The beaches in Pafos are pebbly but a bus ride away is the beautiful Coral bay well worth going to. I can't imagine wanting to go anywhere else!